These impending Motorola Android phones are getting rather tricky, aren't they? 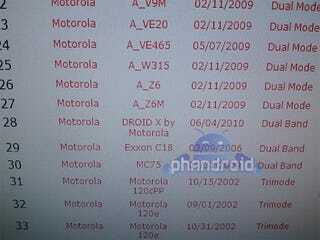 So far we know the Droid 2 Shadow will be the successor to last year's Droid, with a slide-out keyboard. The Droid Xtreme is the keyboard-less phone which was found in a Verizon gym the other week, but is said (thanks to some spy-shots of Verizon's marketing system) to be called the Droid X.